US President Barack Obama has cancelled a meeting in Moscow with Russian President Vladimir Putin due to the two countries ongoing dispute over NSA whistleblower Edward Snowden, the White House said. “We’ll still work with Russia on issues where we can find common ground, but it was the unanimous view of the president and his national security team that a summit did not make sense in the current environment,” White House Deputy National Security Adviser Ben Rhodes was quoted as saying by the Associated Press. The White House said on Monday it was evaluating the “utility of the summit” after Russia granted Snowden temporary asylum in the country. It is understood that President Obama will still attend the G20 meeting in Saint Petersburg in early September. 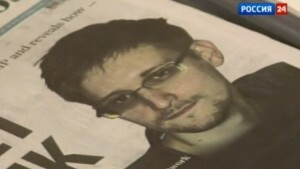 Snowden has been charged by the United States for leaking classified information from its surveillance programmes. The Russian president said previously he did not want the Snowden affair to damage Russia’s relations with the United States. However, US lawmakers and officials have described Moscow’s decision to protect the NSA leaker as a “slap in the face” to the United States and urged Mr Obama to reconsider his approach to building ties with Russia. Peter Lavelle, host of RT’s flagship programme CrossTalk says the announcement was to be expected. “It is no surprise Obama has cancelled his planned meeting with Putin. Moscow will not bend to Washington’s pressure on the Snowden affair or on Syria. Putin has onboard public support at home on both issues. “Importantly, Russia is on the side of international law as well. In the end, Washington has decided to worsen relations with Russia over selfish and narrow minded political pettiness,” Lavelle told The BRICS Post. Relations between Russia and the US have also been strained by their different approaches to resolving the Syrian crisis.